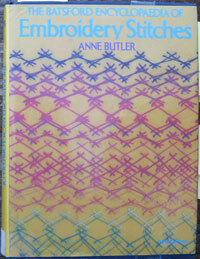 I was looking through Sharon’s stitching books and was drawn into The Batsfords Encyclopedia of Embroidery Stitches by Anne Butler…Sharon reviewed this book when she found it. As I said I was drawn into this book and decided to stitch my way through the chapter on Stem Stitch which is in the same family of stitches as the back stitches that I have been doing recently. Although these stitches are in the same family they all have individual names and embroidering every name would get very tiresome but for the practical reason of being able to have the name of the stitch easily referenceable when using the sampler for seam ideas I have started writing the name of each stitch on the back of the sampler…Click here for a big image of the back for the names of the stitches. This is also the start of Take it Further September Colours. This one is for my daughter, a Couple of days before I embroidered it she asked me if I was going to record that her boys, The Canberra Raiders rugby league team, were in the top 8, She is a true fan and delighted when I showed her the sketch of my design. I got the shape of the ball by tracing around the one on the photo of the Raiders Quilt that I made her a few years ago. I stitched the 2 fabrics together and embroidered the detail and then appliqued it in place with a little padding. Today, the 26th September, is a special day in my life and to celebrate I have cut a hole in the fabric of my Band sampler…This may seem like a crazy way to celebrate anything but believe me it is fitting for the event I celebrate as will be revealed when I have finished embroidering the detail. I haven’t been Keeping up with my blogging recently but I have been stitching and the next thing to go onto my sampler was the Paralympic games…I introduced it with the fact that I had to buy a Set Top Box so that I could watch the extended coverage of the games on ABC2, the need for a Set Top Box is that Australia is changing TV Broadcasts from Analog to Digital and a Set Top Box is the gadget that enables old Analog TV sets to receive broadcasts from the new digital channels. 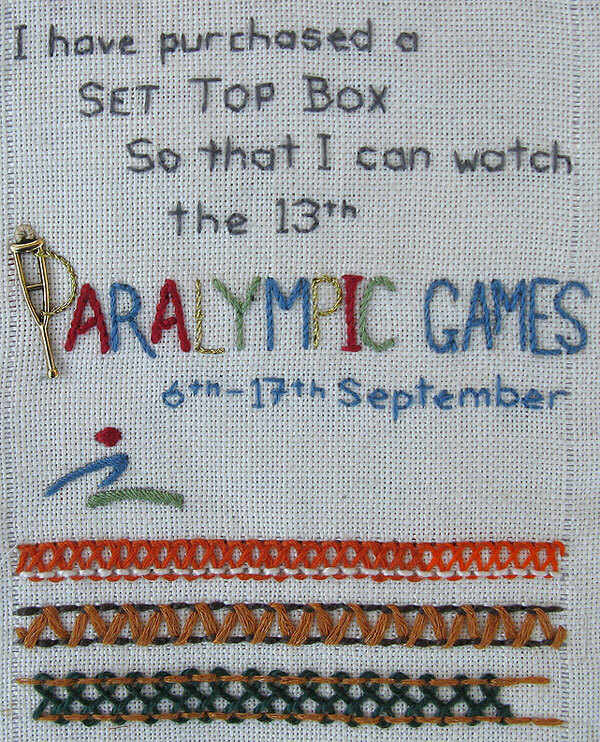 For the words I used the colours of the Paralympic games logo plus a gold thread and stem stitched the letters. 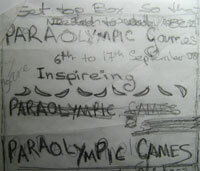 Then I stitched the logo of the 2008 games and was going to embroider the moon shapes of the games logo scattered along under the date but changed the design when I realized the the 2008 games logo was a stylized wheel chair athlete, I couldn’t see it initially because I was seeing the left side as the front but as I watched the wheel chair athletes pushing their chairs I saw the logo in perspective, once I saw it I couldn’t resist making the next line of embroidery orange with a white line to give them a track to roll on and I had to leave the space in front of the logo free so that the athlete has room to zoom…interesting that my Olympic detail also has a blank spacebut for a different reason. 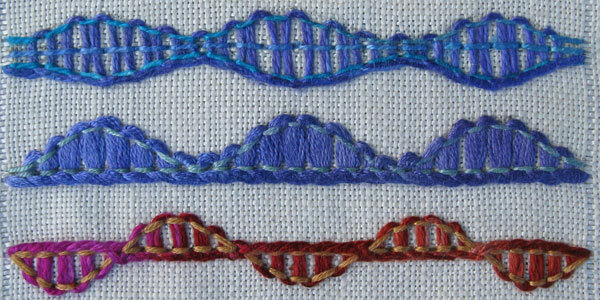 The stitch I used for the track is a combination of the next 2 lines both variations of threaded back stitch. The top line is triple Pekinese with the 2 outside rows of back stitch being wavy. 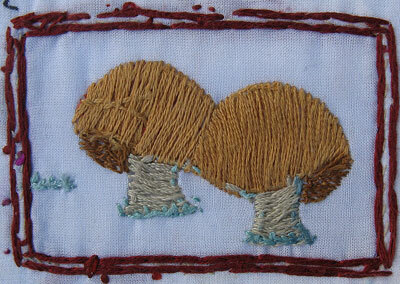 The middle line is double pekinese stitch with one straight and one wavy line of backstitch. The bottom line is double pekinese stitch with one straight line of back stitch and wavy line that criss crosses the straight line, For this variation each time the lines crossed I changed the side from which I worked the loops of the pekinese stitch. These details are also the last of my 12 inches of stitching with the August Take it Further colours. A few nights ago I showed double back stitch and the pattern that double back stitch looks like on the back of the fabric. When I showed Sharon I commented that I had actually stitched the back pattern from the front side and that it felt like I was stitching a two sided Stem Stitch, Sharon pointed out that it was actually Closed Herringbone, which was obvious to me as soon as she said it and at the same time I realized that I have always known double back stitch as shadow embroidery which is what it is when done on a sheer fabric so that the closed herringbone on the back can show through the fabric…The next week I found a stitch, in The Batsford encyclopaedia of Embroidery Stitches, called side stem stitch which looks like 2 very close rows of back stitch…The way that a single stitch can have 2 or more names and in other cases a single name can be used for 2 different stitches makes nameing stitches difficult which is why I prefer to think of stitches as variations on the family groupings such as buttonhole or even more broadly as straight, looped and knoted stitches. Shadow Embroidery, which I now know as double back stitch, was the first embroidery stitch that I ever learnt when I embroidered my initials on the front of a half slip petticoat. To do a sample of Shadow embroidery on my sampler I cut a hole in the linen and turned the edges under to expose the lining which is a sheer fabric. 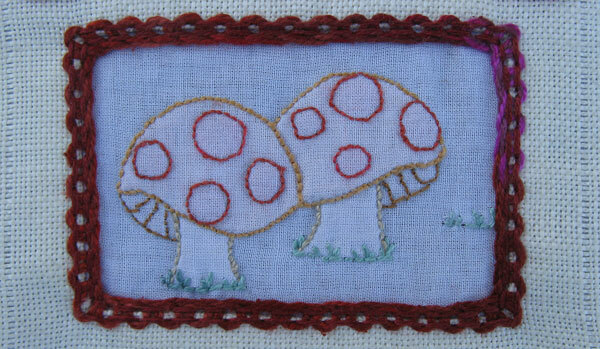 I was delighted with how well the double pekinese stitch worked to make a frame for the mushrooms. Top line Spring…For the words I used pekinese and back stitch, the stitches that I have been working on, with detached chain stitch and a colonial knot to dot the i…I have added insects for a finishing touch, the grub on the tail of the g is about 40 tiny sequins with a colonial knot and tiny straight stitches to make the head. 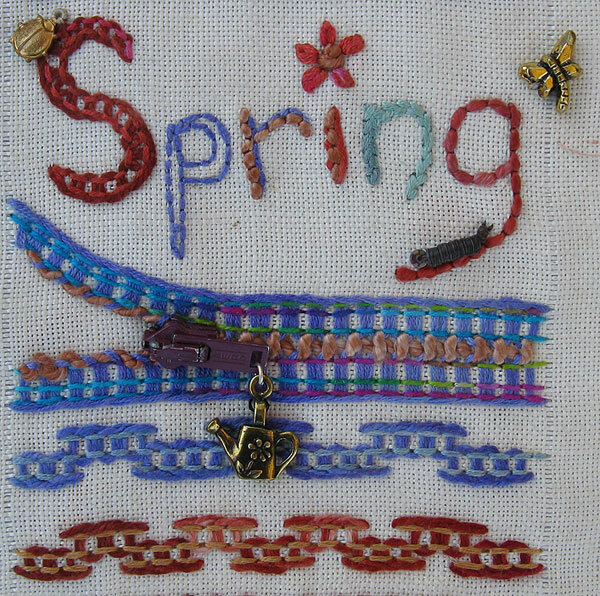 The second line is Laced Triple Pekinese which I recognized as a zipper when I curved the top row, the finishing touch was a zipper pull which I linked to the spring theme by with a watering can….I liked that it has the double meaning of being a zipper and zipping into spring. The Third line is similar to the variation that I did for TAST Last year, and the bottom row is the same but using groups of 3 rather than 4 stitches on either side of the central row of back stitch. The middle line is Pekinese Stitch. 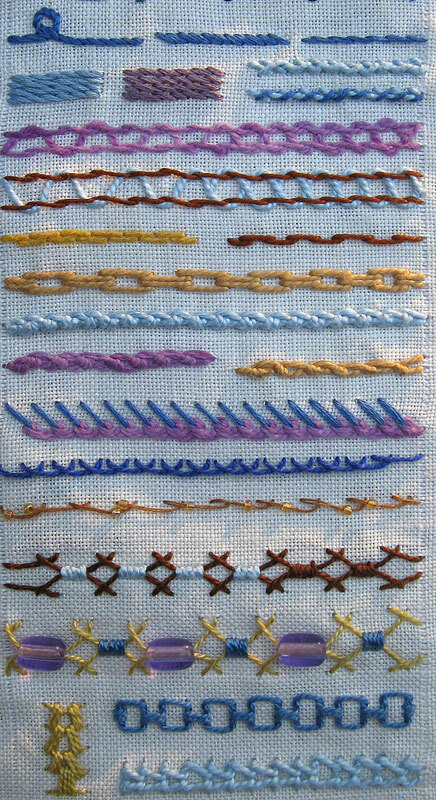 running out of back stitch ideas I remembered that when Elizabeth at Quieter Moments experimented with back stitch I was impressed that she could even make the humble back stitch exciting so I went back for another look. I found another Threaded back stitch variation which is the top line…well I thought that it was until I have just looked again while getting the link, Elizabeth 2 rows of back stitch have the stitches lined up and she has threaded through every second stitch, I did double back stitch which has the stitches in the 2 rows staggered, my stitches are longer and I threaded through every stitch. The other stitch that I found was the double back stitch which is the second line and I liked that she had what the stitch looks like on the Back which is the bottom line. The top line is Threaded Back Stitch. The second line is Threaded Back Stitch which I have threaded back around each stitch to make a loop. The bottom line is a back stitch pattern that jumps out at me every time I see it on Sharon’s sampler, I think that it is simply beautiful Sharon drafted it from a 16th century Italian sampler at the Victoria & Albert Museum. I am finding that as time goes by I am writing more notes on the lining of my sampler…My notes are a little cramped and some of them may well need a little deciphering but I like that the information is recorded with the details.